1. How much does (experimental) DNA cost? 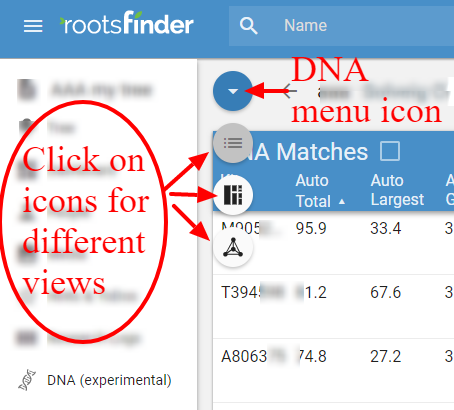 RootsFinder DNA tools are free while in the experimental phase. We hope to be done with testing and enhancements in August 2018. At that time, DNA tools will become part of the Pro Plan. 2. How do I update my views with new matches? 3. Will I lose my notes and tree assignments if I update my matches? No. Notes and tree assignment are preserved. New information is merged in with your existing kit information and you won't lose any notes or matches. 4. Why isn't there any color coding in my tree? Color coding isn't automatic. Kits are only color coded after they are matched to someone in your tree. To color code a kit, click on the kit number or node in any view. Click on the pencil icon in the upper left corner and select the Match tab from the edit box that comes up. For more information, please see the Kit View help page. 5. Nothing happens when I click on the tree icon in my List View. Where is the tree? 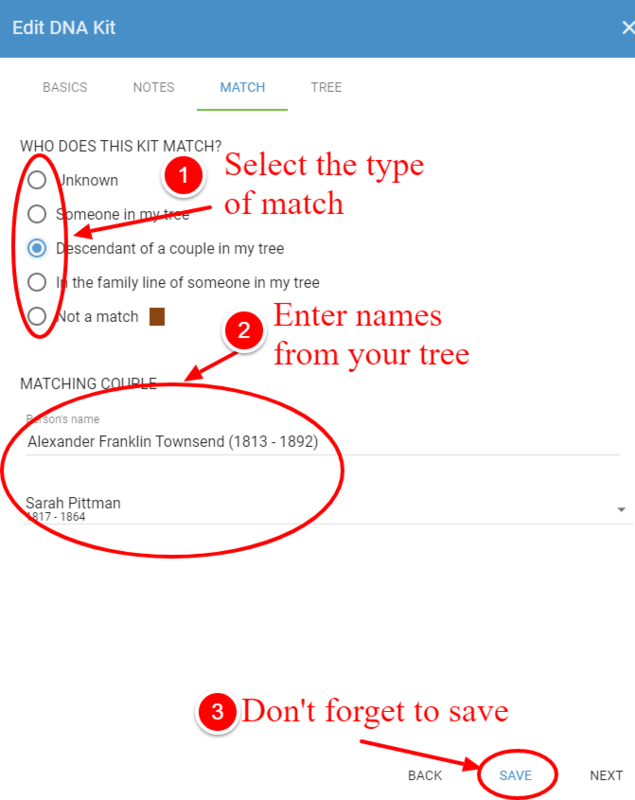 Open the pedigree view at GEDmatch or WikiTree. Select the entire page by clicking Control-A (for PC users) or Command-A (for Mac Users). Copy to your clipboard by clicking Control-C (for PC users) or Command-C (for Mac Users). At RootsFinder, click on the gray instruction box. Click Control-V (for PC users) or Command-V (for Mac Users) to paste the pedigree information into the gray box under the Tree tab in the Kit View edit window. For more information please see the Kit View help page. 6. Why isn’t there a tree with this match? 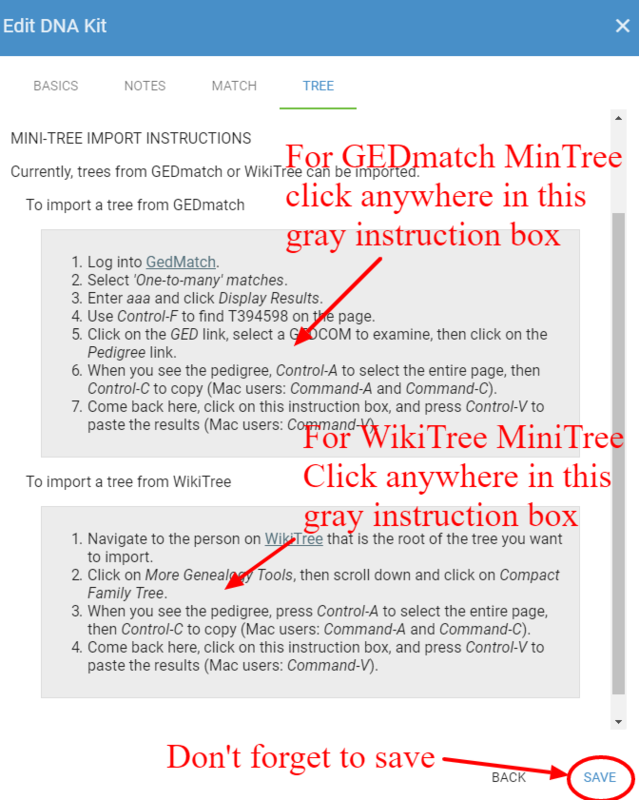 Not all kit owners upload a tree to GEDMatch. If you contact them, they may have a tree elsewhere. If they upload their GEDCOM to RootsFinder and invite you to it, you will be able to work together and see their tree. 7. Where is the Chromosome Browser? The Chromosome Browser is at the bottom of the Kit View. Click on a kit number or node in any view to open the Kit View in the right side bar. Scroll to the bottom of the Kit View. 8. Why can't I get my GEDmatch Genesis files to upload? RootsFinder does not support GEDmatch Genesis yet. We plan to implement it soon. 9. How do I match kits to my tree? Kits can be matched to your tree from the Kit View edit window. To open the Kit View edit window, first click on a kit number or node in any view. The kit will appear in the Kit View in the right side bar. Click on the kit number to open the Kit View. Then click on the pencil icon. Choose the Match tab. For more information, please see the Kit View help page. 10. Where are the DNA tools? Click on DNA tools in the left side menu. Click on the DNA Kit number you wish to see. This opens the List View for that kit. The DNA menu is accessed by clicking on the down arrow inside a blue circle at the upper left of your List View. The first icon is for the List View. The second icon is for the Segment View. The third icon is for the Triangulation (cluster) View. 11. Where do I paste my DNA data? Where is the gray box? 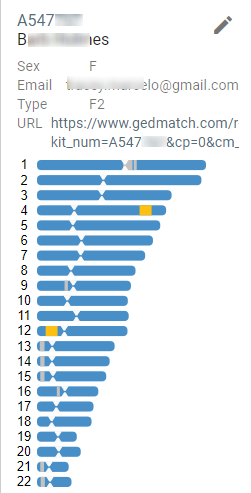 Click on DNA in the left side menu. Click on the "+" at the top right of the DNA landing page. This opens a window where you enter the kit number and the person it belongs to. When you have filled in the kit number and the name of the person it belongs to, the save button will turn blue. Click save. The instructions are in a gray box on that next screen. Click on the gray box that has the instructions in it and press Control-V (for PC Users) or Command-V (for Mac users). 12. Can I add a kit for someone who is not in my tree? No. You must first add the person to your tree. 13. What does the trashcan icon do? It deletes all your views. The kits and their matches to your tree are stored. That way, if you upload another kit and it has the same kit(s) in it, they will already be matched to your tree.